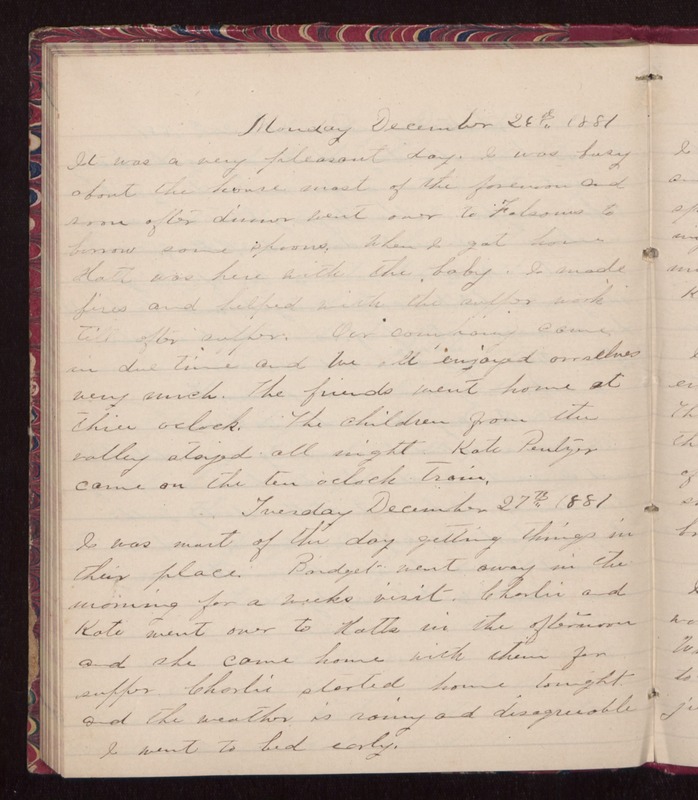 Monday December 26th 1881 It was a very pleasant day. I was busy about the house most of the forenoon and soon after dinner went over to Folsoms to borrow some spoons. When I got home Hatt was here with the baby. I made fires and helped with the supper work till after supper. Our company came in due time and we all enjoyed ourselves very much. The friends went home at three oclock. The children from the valley stayed all night. Kate Pentzer came on the ten oclock train. Tuesday December 27th 1881 I was most of the day getting things in their place. Bridget went away in the morning for a weeks visit. Charlie and Kate went over to Hatts in the afternoon and she came home with them for supper. Charlie started home tonight and the weather is rainy and disagreeable. I went to bed early.